You may not be thinking about winter or clearing snow in July. However sometimes this is when the best deals can be found for snow blowers and snow throwers. The John Deere 1338PE Snow Thrower has lots of features that will interest many suburban and commercial snow clearing companies. With 38 inches of clearing width, you can be sure to make short work of most snow clearing situations. It comes with a 4 quart fuel tank. It will keep you going for long periods without having to stop for fuel filling. The augers are made of steel and 14 inches in diameter that will cut through tough snow and ice. Some of the other features that many consumers will appreciate include such things as free hand control for easy operation of controls; Quick Turn drive system; single trigger locks one wheel while other turns; dual halogen headlights for better ergonomics and visibility; heated hand grips standard (2 positions); and it also includes a tool box and clear out brush. For a full list of features refer to our specification list and feature list. Prior to starting your snow blower the first time each day, perform a quick walk around check of the machine to ensure there are no loose parts and no leaking fluids. Check the engine oil to ensure that it is at the correct level as specified by the manual. Top up if necessary. Fill the fuel tank while the engine is cold and prior to using the machine. If you do spill fuel, wait until it has fully evaporated prior to starting the engine. Never spill fuel on a hot engine to avoid fires and always fill the fuel tank outdoors to avoid any possibility of vapors going into your house. 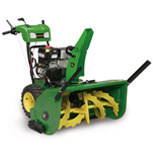 For more John Deere snow blower reviews, click here.